Yesterday my co-worker described to me her pre-Thanksgiving shopping trip to Morning Glory Farm. We got to giggling about how much beautiful produce she wound up stuffing in her cart — and her family wasn’t even coming for dinner until the day after Thanksgiving. This reminded me of two things: First, the cooking isn’t necessarily over after Thanksgiving Day. If you’ve got a house full of family and guests, you have to keep feeding them over the holiday weekend (surprise! ), and turkey leftovers only go so far. Or you might even be the family that decides to hold the big feast on Friday or Saturday to ease tensions over conflicting schedules. Second, it’s not surprising that we bring home a few extra vegetables this time of year. We all have a bit of that pre-winter hoarding instinct, and the winter vegetables are so alluring and comforting that it’s hard not to stock up on them when we see them. It would be nice if we could use a few in the name of keeping these houseguests from starving or getting scurvy. But if you’re like me (and my co-worker), sometimes you buy things — especially vegetables — because they’re pretty or intriguing. Then, uh-oh, what to do with them? Root vegetables can cause particular consternation. In fact, you might not even get as far as putting them in your shopping cart if doubt and cooking jitters set hold. Truth is, many of the overlooked root veggies like parsnips, celery root and turnips are culinary stars that can help fill the weekend holiday table. They’re also nutritious, providing good amounts of soluble fiber as well as vitamin C and anti-oxidant phytonutrients. And they are much more versatile than you’d think. To make a velvety pureed soup, start by sautéing onions or leeks with sliced apples or pears. Add equal amounts of chopped peeled root veggies (choose one) and chopped peeled potatoes, and a teaspoon or two of chopped winter herbs or your favorite warm spices. Cover with plenty of broth and simmer until the veggies are tender. (If you like, replace a small portion of the broth with apple cider). Puree and finish by whisking in an ounce or two of cream, yogurt or coconut milk if you like. Take that idea of fifty-fifty potato-root veg and apply it to any number of dishes that usually only star potatoes. Make a creamy gratin by slipping some thinly sliced turnip or celery root in with the potatoes. Instead of mashed potatoes, do a rustic mash of celery root and Yukon gold potatoes with roasted garlic and horseradish. Any mashed root vegetable gets much more interesting in my mind if it is turned into fritters or savory pancakes by mixing with an egg, herbs, and spices and dusting with flour before frying. One of my very favorite methods for cooking these root veggies is to do a stovetop “slow-sauté.” Unlike a traditional sauté where the heat is high and the pan uncrowded, this method uses a fairly crowded pan (a well-seasoned cast-iron skillet is great or use a straight sided-nonstick skillet) and lower heat, as well as lots of olive oil, to cook the veggies slowly. The root veggies give off some moisture in the crowded pan and the steam helps to cook them through while the direct heat of the pan browns the edges for great flavor (see recipe). 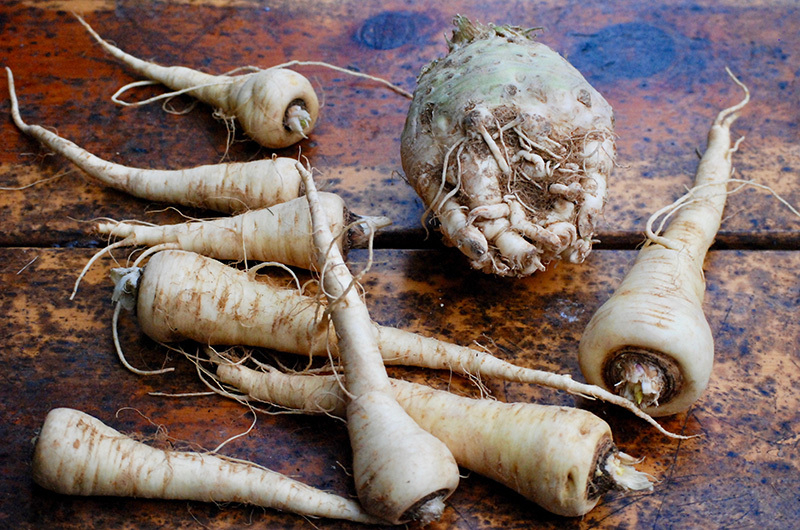 Celery root (or celeriac) needs aggressive peeling, but after that, the piquant flesh can be grated or julienned and used raw in salads or slaws. When pairing flavors with these underappreciated root vegetables, remember that turnips and celeriac have bitter and stringent notes, so something both salty and sweet will help temper those. Parsnips, on the other hand, are quite sweet and very mineral-y, so anything acidic — lemon juice, lime juice, balsamic — will brighten the dish and cut the sweetness. While I realize you can’t exactly live off root vegetables for the rest of the weekend (well, actually you could if you really wanted to), hopefully, these quirky veggies will at least give a boost to your winter repertoire.